iPhone Backup Unlocker is the very password recovery program that enables you to forensic access to password-protected backups for iPhone, iPad, and iPod when you need to restore your iDevice from the backup file. It recovers the original plain-text password that protects encrypted backups containing address books, call logs, SMS archives, calendars, camera snapshots, voice mail and email account settings, applications, Web browsing history and cache. Unlock iOS device Backup - Unlock new iPhone 5s/5c/5 Backup Now! 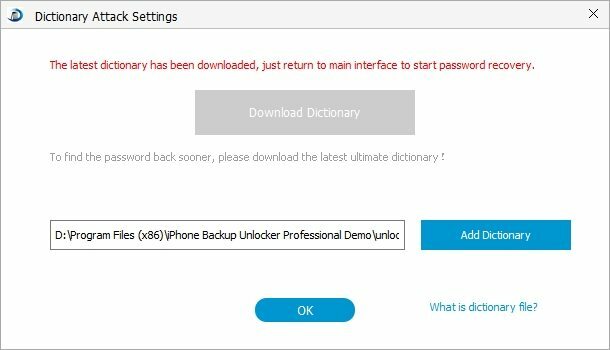 iPhone Backup Unlocker can quickly and effectively recover iTunes backup password which is certainly required if you need to restore your iPhone, iPod, iPad from this password-protected file. Without retrieving this password, the lost contents on your device including contacts, SMS, call history, photos will be gone forever. 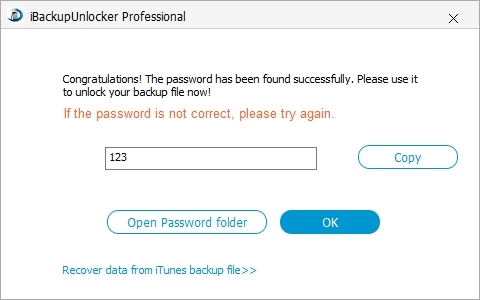 This iPhone backup unlocker software can also gain access to information store in password-encrypted iPad and iPod backups. It is fully compatible with all the iOS device release to date: original and "jailbroken" iPhone 5s, iPhone 5c, iPhone 5, iPhone 4, iPhone 4s, iPhone 4, iPhone 3gs, iPad 4(iPad with Retina Display), iPad mini, iPad 3, iPad 2, and iPod Touch (all generations) devices. With optional Brute-force Attack, Brute-force with Mask Attack, and advanced Dictionary Attack with highly customizable permutations, this program can unlock all the backup files generated by all versions of iTunes (incl. 11) and iOS (up to iOS 7). However, it performs offline attack without Apple iTunes installed. The instructions are intelligent: For importing, this program will automatically detect the Backup Key Container File which should be utilized if you need to decrypt backup password. Moreover, if you decide to quite the recovery temporarily, save and import the previous attack results to resume recovery without re-attacking. GPU acceleration reduces the time required to recover iPhone/iPad/iPod backup passwords by orders of magnitude. The latest generation of GPU acceleration technology supports unlimited numbers of ATI or NVIDIA boards. With fancy interface, you can easily operate it to recover iPhone, iPod and iPad backup. It works well with Windows 7 (64 bits & 32 bits)/Vista (64 bits & 32 bits)/XP (32 bit). Tenorshare iPhone Backup Unlocker is an outstanding password recovery tool, providing solutions for iOS device users to find lost or forgotten iTunes backup password and regain access to iTunes backup. It offers 3 types of attacks to choose from, which improves the efficiency of decryption. 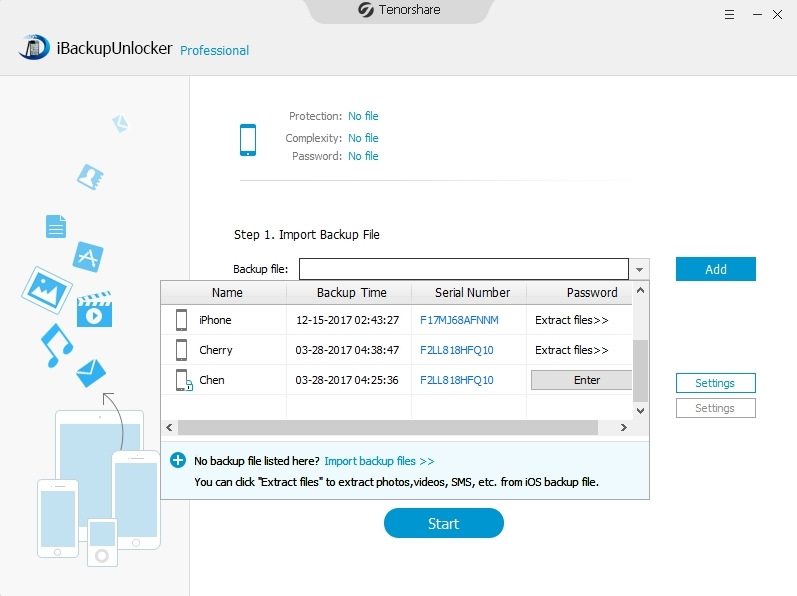 After download and installation, run Tenorshare iPhone Backup Unlocker on your PC. To decrypt iTunes backup, what really matters is the file with extension manifest.plist. We need to click "Open" and import this file (key container file) to the program. Note: When click "Open" the program will automatically navigate to the folder containing this file. 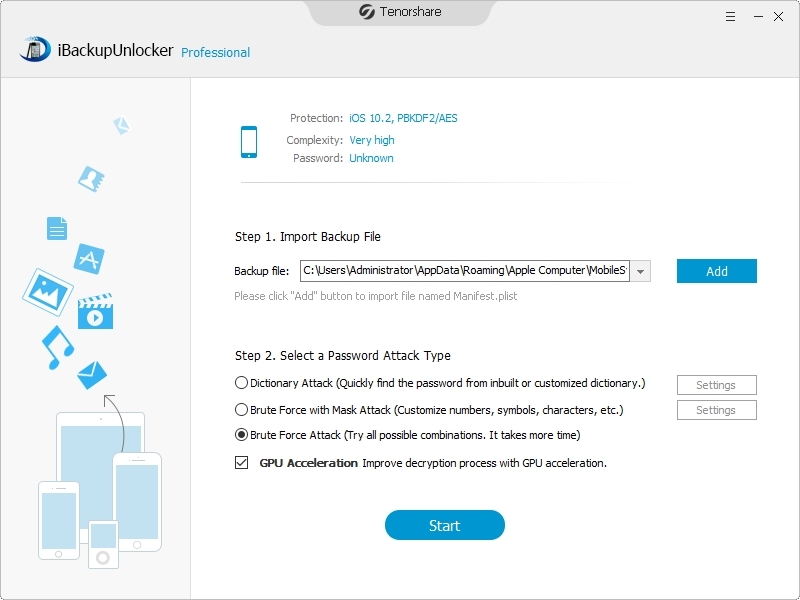 Tenorshare iPhone Backup Unlocker provides 3 types of attacks, namely Brute-force Attack, Brute-force with Mask Attack and Dictionary Attack. Select the most appropriate one to effectively retrieve iTunes backup file password. Brute-force Attack is a kind of attack that will try every possible combination of password. Choose this attack when you have no clue what the password may be, and there's no setting for this attack. However, this attack may take the longest time to find password. 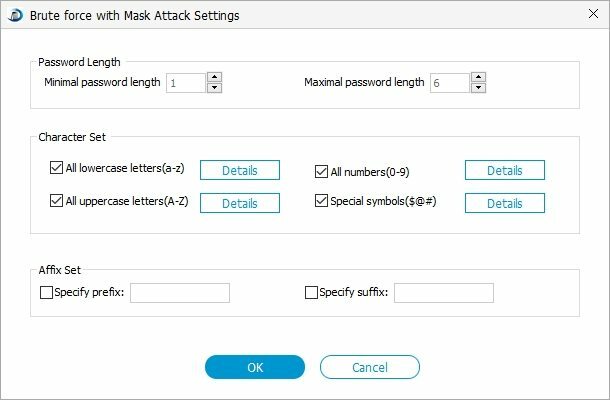 If you remember something about the password, say the length of the password, you could choose Brute-force with Mask Attack. The settings of this attack include Password Length, Character Range and Affix. Set these items could help you find lost password more quickly. If the iTunes backup password is one of your frequently used password and you are not sure which it is, choose Dictionary Attack. You could set a text file with all possible passwords and import this text file to the program. Along with this text file, there will be a default dictionary, both of which are for the reference of the program. When all these are settled, click "Start". iPhone Backup Unlocker will start to find password. During the decryption process, you are allowed to tap "Stop" if you have an emergency to deal with. When you are back, you could continue the decryption. A few minutes later you'll see a pop-up window displaying your iTunes backup password.